As someone who has never worked in theater but is enamored of the whole theater world, I'm often curious about the rehearsal process and how a piece of theater is created. Sarah Ruhl has given us a peek inside that world in her play Stage Kiss, now playing on the Guthrie's Proscenium Stage. I don't know how accurate it is, but it's a pretty hilarious look at the entire process of creating a performance, from audition, to first read-through, to blocking, to dress rehearsal, all the way to opening night. 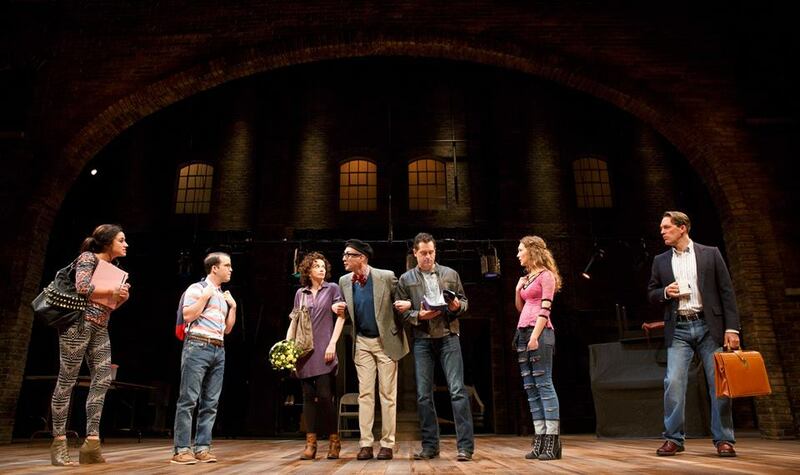 The writing, as delivered by this fantastic cast, is laugh-out-loud funny and the play (which Sarah notes is "for actors") is a loving send-up of acting, theater, and love. 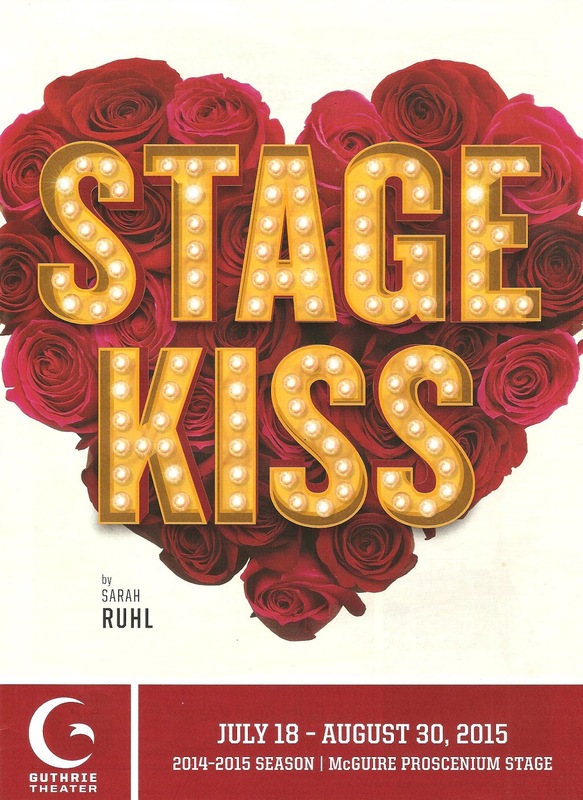 Stage Kiss is one of those play-within-a-play shows (actually two-plays-within-a-play), providing multiple levels and nuances for this great seven-person cast to play with under the sharp direction of Casey Stangl. As opposed to the character of the director, who doesn't seem to have a clue what he's doing in directing a 1930s flop called Last Kiss in a New Haven theater. He seems flummoxed whenever he's asked a question, and often talks about the "slippery" tone of the play, in which a wealthy married woman finds out she's dying, sends for her first love, and is reunited with him, only to watch him run away with her daughter. Complicating the rehearsal process is that the actors playing the woman and her lover are former lovers in real life, with some unresolved feelings about their relationship. The line between art and reality begin to blur as they find themselves drawn to each other, remembering why they fell in love so long ago, until they remember why they broke up. The play has some fantastical elements, as characters in the "reality" portion of the play step out to speak their feelings, or break out in song, while seeming perplexed that they're singing. There's nothing slippery about the tone of Stage Kiss, it's the humor of heightened reality. Six of the seven actors in this cast have multiple roles to play, both in the play world and in the "real" world, and all appear to be having a blast with the wide range of duties, from sitting bored in a rehearsal room to over-the-top acting as characters in the play-within-a-play. Stacia Rice is so funny and natural as the actress, in contrast to the delightfully exaggerated play roles. A dreamy Todd Gearhart is a great match as her lover on stage and off. Michael Booth plays the actress' husband both in the play and in the real world, like flip sides of the same coin. Grant Fletcher Prewitt (half of the great comedy duo that was last year's Rosencrantz and Guildenstern) is a scene-stealer with his genius physical comedy skills, eliciting laughter from the audience just from walking onstage in his second act getup. Cat Brindisi and Rebecca Hurd provide great support in multiple roles, both real and deliciously over-the-top. Charles Hubbell is the one member of the cast who exists only in the "real" world, as the amusingly daft director. Devon Painter should be commended for displaying great range in her costume design, which includes cute and chic modern wear, the glamorous world of the '30s, and outrageous '70s costumes in the second act play-within-a-play (entitled I Loved You Before I Killed You, or Blurry, it's too ridiculous to be described). Todd Rosenthal's set design is also quite versatile with lots of moving pieces and startling transformations. We're taken from the bare stage and brick walls of a theater rehearsal room, to a sleek '30s living room, to a shabby '70s apartment. It's fun to watch the progression of sets and costumes in the ongoing rehearsals in the first act, beginning with street clothes and markings on the floor, slowly adding a wardrobe piece here or there, or a representative piece of furniture or two. If you've ever pored over the rehearsal photos that the Guthrie often includes in their playbills, you'll recognize the idea. The Guthrie is a busy place this summer with the scrumptious smash hit The Music Man causing larger than usual crowds. I just hope that visitors to River City also check out the Guthrie's many other great offerings, Stage Kiss among them. While The Music Man is a heartwarming and overflowing production of a classic musical about small town America in the last century, Stage Kiss a very funny and modern new play that is an homage to the theater world we love so well (playing now through August 30).